This essay was first published in the Vanguardia Dossier no. 65. It has been updated slightly. Read this essay in Spanish. PDFs courtesy of La Vanguardia. Globalization is under attack in the West. The debate among pundits is no longer about whether globalization is to blame or not. It is about why globalization is now the bugaboo it has become. Is the resistance to globalization grounded in economic losses for the once-secure middle class citizens of the Western-style democracies, and the fear of future losses for them and their children? Has anti-globalization grown because the growth of trade has brought economic competition from China, reducing high-wage manufacturing jobs, and more immigrants taking once steady working class “trades” and construction and other service jobs? Or is the anti-globalization movement (Trump’s America First) a by-product of what we call, in the United States, the “culture wars?” Is the rise of protectionism and anti-immigrant, nationalist xenophobia fundamentally about inchoate resentment of a new “cosmopolitan” elite: the corporate “Davos men,” bankers, lawyers, “experts,” even academics, whose globalist attitudes and networks are unmooring Western societies from allegiances to traditional nationalist, ethnic, and religious customs and values? Of course (my kind reader is thinking), it is some of both. A common thread, however, are changes, for the worse, in the economic and social standing of the Western middle class. In the last three decades, the opening and integration of markets—the phenomenon we loosely call “globalization”—has had opposite effects on the psyche of the middle class in the rich relative to the developing world. The opening of markets, since about 1990, has created and inspired a new, small but growing and forward-looking, middle class in the developing world, still relatively poor compared to the middle class in the West, but enjoying the kind of material security and sense of good prospects for their children associated with the idea of the postwar Western middle class. During the same period, the larger (and still far richer) middle class in the West has declined in size, and the prevailing mood among many of its members is one of anxiety and pessimism about their future prospects including those of their children. It does not help that their social standing at home has also declined, with the emergence of a new wealthy “elite” with global connections and “globalist” attitudes. In the mature economies of the western world, the middle class, considered from Aristotle to de Tocqueville the bulwark of democratic government, has been losing out, capturing a declining share of total income growth. Between 1991 and 2010, as reported this month in a Pew Research Center study, the size of the middle class, defined in these studies as those households with income between two-thirds and double each country’s median household income, fell in the United States, Germany, Italy, Norway, Denmark and Spain (though not in the United Kingdom and France). That cannot entirely be blamed on the opening of markets in the developing world—but it is also not entirely a coincidence. In the developing world, and most dramatically in China, a new middle class has been on the rise since the fall of the Berlin wall and the almost universal post-Cold War embrace of open markets, growing in numbers and capturing an increasing share of total income in their own countries. In 1990, the middle class in the developing world, defined using an absolute income standard of at least US$10 a day per person, or annual household income of about $14,000 for a family of four, was tiny. US$14,000 a year is far below US median household income of $50,000 in 2010—yet is still far above median income in most developing countries, so that the “middle class” in poor countries is not “middle income” in their own countries, but has characteristics associated with the middle class in the rich world—including steady, often salaried, jobs and at least secondary level education. In China, India, and sub-Saharan Africa, the US$10 a day middle class represented less than two percent of the population in 1990—and probably was composed mostly of civil servants. Most people in Asia and Africa were still either terribly poor or just scraping by. Then growth took off across the developing world, and accelerated further during the first decade of this century as those countries “globalized,” opening their markets to trade and foreign capital, and benefiting from low global interest rates and a global commodity-demanding boom. Between 1990 and 2015, by my estimates, some 900 million people entered the $10-per-day middle class and another one billion people escaped dire poverty of just $2 a day or less, as defined by the World Bank’s international poverty line. The most extraordinary middle-class growth came (and continues to come) in urban areas of China. In 1990, the $10-a-day middle class comprised an estimated 0.3 percent of China’s urban population—about one million people. By 2010, it had grown to 35 percent of China’s now much larger urban population—about 220 million people. By 2015, the figure had reached an estimated 340 million. From 2 million to 340 million people is an astonishing change—and because China is such a big economy with such a large portion of the world’s population, that change alone (without taking into account growth of the middle class in Brazil, Mexico, Turkey, and dozens of other emerging market economies) constituted a reshaping of the contours of the global labor market. 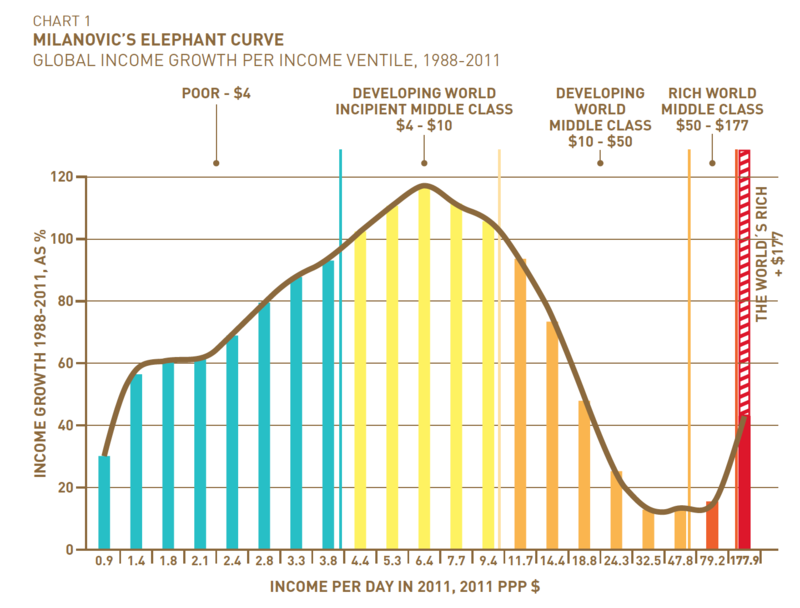 A single chart (the “elephant” curve, below, of the economist Branko Milanovic, modified to show absolute daily income on the horizontal axis) captures the story, at least in terms of income, of middle class decline and discouragement in the West, and middle class rise in the developing world. The chart shows the percentage gains in income for groups of the world’s population between 1988 and 2011, with income groups from poor to rich arranged to represent the group’s shares of total global income over the period. Almost 50 percent of the world’s population, with incomes of less than US$1 to about $4 (blue), are counted as poor (using their own countries’ poverty lines of about $4 a day), and live almost entirely in the developing world. Approximately another 40 percent of the world’s population, with income between $4 to $50 a day (in pale and darker yellow) make up an “incipient” (below $10 a day) or truly arrived middle class; with the exception of a small proportion of that group living in rich countries, this is the “new” middle class of the developing world. Together, these groups are represented by the broad and hunched back of the elephant. A much smaller “rich world” middle class, so labeled because the relevant population lives mostly in the rich countries, has income between about $50 to $200 (in orange, represented by the elephant’s head). Finally, a tiny “world’s rich” group—including the top 1 percent of households in the world by income (in red, represented by the elephant’s trunk) takes up the right-most portion of the chart. The graph illustrates that the middle classes in the developing world (the pale and dark yellow broad back of the elephant) have been the big winners of open and globalized markets, growing in size (as in the China example above of a new 300+ million people) and enjoying (with many having moved out of poverty into the middle class) income gains, on average, between 20 and over 100 percent over the 20-year period. In contrast, their counterparts in the rich world middle class (in orange) had average real income gains over 20 years of less than 20 percent, or just 1 percent per year. Meanwhile, in many Western economies the middle class was hollowed out; in the United States, it declined as a share of population from 62 to 59 percent in the last 20 years. In relative terms, the rich world middle class appears stuck at the bottom of the elephant’s trunk. For the developing world, globalization has been a success. Open markets have fueled economic growth that lifted a billion people out of dire poverty and created a new middle class. Growth also ushered in a remarkable period of reduced mortality, greater access to education, improved governance, and even (it seemed for a while), democracy itself. Behind the big and broad back of the elephant, in short, is rapid economic growth in the developing world—at rates, averaged over two decades, faster than economic growth in the mature Western economies. Open markets and growth helped boost the size of the $10-a-day middle class not only in China, but also in Brazil, Mexico, Turkey, and in much of Central and Eastern Europe—by my count, increasing the share of the middle class in those countries’ populations from around 35 percent in 1990 to 65 percent by 2015. Taking advantage of technologies and business processes first honed in the rich world, average incomes in developing countries, which had increasingly diverged from faster growing rich countries for most of the 20th century, are finally catching up in a process economists call income “convergence” and see as the natural order of things. In Western Europe and America, economic growth has, not surprisingly, been slower—typical of already mature economies. In the West, globalization is associated not with faster growth and better prospects, but with fewer middle-class jobs and lower wages, especially in manufacturing. After all, trade with China meant the integration of its huge low-wage labor force into what became a global labor market. It is true that technological change, especially automation, mattered as well, and probably even more, for job losses in the rich world. But globalization can be implicated to the extent that trade and foreign investment have accelerated the spread of new technologies and associated know-how to developing countries—and thus those countries’ increasing ability to compete in the production and export of increasingly sophisticated manufactured goods. Compounding resistance to globalization in the mature democracies, globalization has become associated with the increasing concentration of income and wealth at the top and the relative loss of stature and political influence of the old middle class to a new professional and business elite—the 1 percent in the United States, which, in 2014, captured more than 20 percent of income (and, by some estimates, held over 40 percent of wealth). The result: a huge, probably unprecedented gap (the data were not so good in the early 20th century Gilded Age) between the rich and the middle class, especially in the United States and the United Kingdom, but a reality even in the more egalitarian societies of Nordic countries and Germany. The gap between the rich (the tall but skinny trunk of that elephant) and the middle class (at its bottom), has been quantified and clarified in the pioneering analysis of tax data of the United States, the United Kingdom and other mostly rich economies by the French economist Thomas Piketty and his colleagues (and was the basis for Piketty’s 2014 best-selling book Capital in the Twenty-First Century). In the United States in 2015, the top 10 percent of households by income captured more than 50 percent of all income, and the top 1 percent captured almost half of that: 22 percent of all income. That was the highest level recorded for the top 1 percent in the 100 years since the Gilded Age—when, in 1913, the US government instituted an income tax. The bottom 90 percent of households enjoyed some income growth, but were still poorer in 2015 than they were when the 2008-09 financial crisis hit. Cornell economist Robert Frank argues that the growth in wealth and income at the top has hurt working and middle class households in ways hard to capture in income differences alone. The new rich, for example, push up house sizes and prices in good neighborhoods—making middle class residents “house-poor” as they spend larger shares of their income to live in neighborhoods with good public schools. Princeton economists Anne Case and Angus Deaton have documented the increase in mortality and morbidity of white men in the United States whose loss of secure income and social status is associated with alcohol and opiate addiction—not unlike the rise in male mortality in Russia following the collapse of its planned economy with the dissolution of the Soviet Union. Carol Graham of the Brookings Institution has recorded a large gap in the United States in the idea that hard work gets you ahead and are thus optimistic about the future (as in the American dream), between the middle and top quintiles of the income distribution—a gap that is larger in the United States than in countries surveyed in Latin America where the “middle” of the distribution is much poorer on average. Brexit, Trump, and the rise of the populist right in Europe (even when the populist right loses, as it did in France, it captures a large share of votes) are as much about anxiety and insecurity as about immediate economic realities. Even the better-off upper middle class in the West is restless and fearful for the future of its children. After all, globalization broadly defined has meant not only the creation of a Davos-style, unmoored elite, but the more rapid spread of new technologies. Robots and the rise of the gig economy are eating away not only at manufacturing jobs, but at the secure white-collar office and retail salaried jobs that were the bedrock of postwar 20th century middle class prosperity in the West. Meanwhile, there is the aftermath of the financial crisis. In the United States, steps taken by the federal government to rescue the economy from a financial panic and meltdown included “saving” the banks and, more problematically, saving the bankers, but did little to nothing for over-leveraged working and middle-class mortgage holders. In Europe, too, as the Eurozone crisis unfolded, French and German and US bankers were (at least apparently) bailed out—while German taxpayers and Greek pensioners lost out. What is behind the new anti-globalist culture reflected in Brexit, the popularity of Le Pen, the rise of populist right parties in Europe, the election of Donald Trump in the United States? Structural changes in the contours of a globally integrated economy have almost surely mattered. Even if most adherents to the populist right are only vaguely aware of a new middle class in China and Mexico, and have no statistics at hand about the richest 1 percent in their own countries, they correctly grasp that these have to do with something vaguely defined as “globalization” and the capture of its benefits by a globalist elite and its like-minded professional experts. It’s too bad. Globalization is here to stay, and much can be done in the West’s democracies to ensure its benefits are better shared. History and post-election changes in the United States suggest the populist right is not the answer; the answer is the set of economic and social policies that would rebuild the size and income shares of the traditional middle class—at home and abroad. But that is another essay. “Middle Class Fortunes in Western Europe”, Pew Research Center, www.pewglobal.org/2017/04/24/middle-class-fortunes-in-western-europe. “Middle-Class Heroes: The Best Guarantee of Good Governance”, Nancy Birdsall, Center for Global Development, 2015, www.cgdev.org/publication/ft/middle-class-heroes-best-guarantee-good-governance. “Positional Externalities Cause Large and Preventable Welfare Losses”, Robert H. Frank, American Economic Review, 2005, 95(2): pp.137-141. Happiness for All? Unequal Hopes and Lives in Pursuit of the American Dream, Carol Graham, Princeton University Press, 2017.